The bride described the color palate of her May 23rd wedding as ‘hot sunset colors’. We used oranges, pinks, and hints of red and burgundy in roses, spray roses, peonies, tulips, hypericum, and freesia among others. We had a very colorful weekend here a Blossom Basket – 3 gorgeous weddings in 3 gorgeous color schemes. Roses, Asiatic lilies, hypericum berries, and cockscomb came together to form vibrant bouquets with impressive size in bright citrus colors. A modern cascade in whites, purples and blues featuring cornflower, Asiatic lilies, dendrobium orchids, and roses. We hand tinted the blue and silver roses – this custom color is called Cleo. Pink, pink and more pink! These precious bouquets are comprised of roses and spray roses in shades of pink. Capture centerpieces with gerbera daisies are striking and simple. These aspiring young designers stopped by this week. 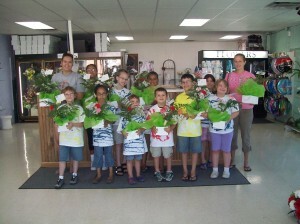 Each kid had fun creating their own floral arrangement to take home. We had several beautiful weddings this past weekend. Nerine lilies and Calla lilies were nesseled into a soft pink hydrangea. The bride’s heirloom hankie was incorporated into the stem wrap. Silver rhinestones sparkeled among these sizzling hot pink roses. Red roses and white dianthus arranged into beatutifully round bouquets looked elegant and lush. The spray rose corsages and boutonnieres coordinated perfectly. One of our lovely brides, B, just gave us these stunning photographs from her June wedding. “Drama, ” she said, “I want Drama.” . She requested a stunning gypsophila (baby’s-breath) and peacock feather bouquet. Her centerpieces were filled with white oriental lilies and white dendrobium orchids.